The village of Datchet, in the shadow of Windsor Castle, has been transformed into a watery scene. Within hours, water rose around The Green where homes and businesses were under immediate threat. Just after 11:00 GMT, a lorry load of sandbags arrived which were quickly snapped up by those desperate to take any measure they could to save their belongings. Melissa Conlon, manager of Perfectly Groomed Menswear, was among them. "The first we knew about anything was on the news last night when the army were helping out nearby," she said. "Since this morning, the water just appeared from nowhere and has crept closer and closer." Julie West, who runs The Outfit clothing store nearby, took the same approach. She said: "It's staggering, as there was absolutely no water around here last night. "Thankfully, sandbags have started to be delivered, but it's taken nearly 12 hours for them to arrive. Why wasn't anything done sooner? "I've had to evacuate my shop long before that as the water on the railway line next door has been rising by the hour." There was sympathy for the council and emergency services from some traders. Lynne Doore, who found water lapping at the door of Butter Me Up Sandwich Shop where she works, said: "I just don't see how people could've anticipated this. "Someone had very kindly put sandbags by our front door this morning while we weren't here, so among the scramble, people have been looking out for each other." 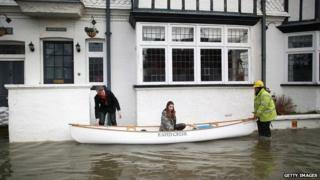 Rachel Bevan's family face an uncertain few hours as they watch the water creep towards their Eton Road property. "Sandbags might have started arriving, but we can't walk them from the lorry to our house as there's just too much water in between," she said. "My sister works in the village, but she's not gone in today as she can't be sure she'll be able to get home at the end of the day." The local council said it had issued 30,000 sandbags but hundreds of people are desperately grabbing what they can as more sandbags arrive. Elsewhere in Berkshire, Colnbrook resident David Wilkinson's home was flooded on Sunday night. "I woke up to five inches of water inside the house," he said. "I am trying to live from hour to hour. "The water came in last night and I'm now flooded out. There was no communication with local residents - this has been building for months. "The response has been inadequate. "A lorry eventually came round last night with a handful of sandbags but it was too little, too late. I'm now seeing dead animals and waste in the water." Paul Palmer, from Hurst, said he has sewage water coming up into his sink as "there is nowhere for the water to go". He wants to have a chemical toilet installed in the village hall as residents are unable to use their own toilets. "For 44 years, I have lived here and I have never seen so many floods," he said. The most severely affected areas in East Berkshire are in Cookham, Bisham, Wraysbury, Datchet, Old Windsor and Horton where officers and councillors are helping out. Streetcare teams have been acting as scouts to identify residents who need help, the Royal Borough of Windsor And Maidenhead said. The council said river levels are expected to reach 2003 levels, and Thames Valley Police are treating it has a major incident. The army has been placing sandbags to try and avert the flooding of the Pingewood electricity distribution facility after the Kennet canal bursts its banks. John Palmer, of Streatley-on-Thames, Berkshire, is installing a pumping system to try and protect his home from flooding in future. "We are a small group of riverside houses here at Streatley and have now been flooded for the second time in five weeks. "We've got used to the flooding and one of my neighbours installed a special pumping system to protect his property after he got flooded the last time round. "We were sceptical but his is the only house that hasn't been flooded so we're all getting them fitted - it looks like there in an answer to this problem for us."